In 1974, a new apparition began to make its appearance in the streets of Manhattan. Even in that hubbub of crowd and clamor, this strange vehicle attracted attention. The Rebbe, Rabbi Menachem Mendel Schneerson, of righteous memory, had sent his tanks into the battle for the soul of the American Jew. If a large part of American Jewry had ceased to come to shul each morning to don tefilIin and pray, the Rebbe was going to bring the tefillin to them. He was going to send one of his students to stop the American Jew on a city sidewalk. “Excuse me, sir,” the lad would say. “Are you Jewish?” If the answer is affirmative, the young man would continue: “Would you like to put on tefillin today? It’s a mitzvah.” The American Jew will be invited to step up onto the truck, roll up his left sleeve, bind the tefillin to his arm and head and recite a short prayer. If the American Jew is a she, she would be offered a free kit containing a small tin candlestick, a candle, and a brochure with all the information necessary to light Shabbat Candles that Friday evening—the proper time (18 minutes before sunset), the blessings in Hebrew and English, and a short message on the importance of ushering Shabbat into her home. 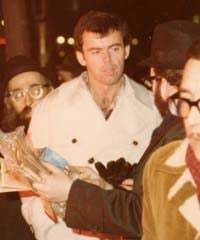 He or she would also be offered literature on the Rebbe’s other “mitzvah campaigns” or assistance in anything from having a mezuzah checked to finding Jewish school for their child. 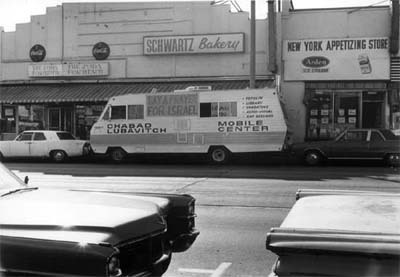 Eventually, the Ryder vans were replaced with mobile homes equipped with shelves for books and comfortable seating for a quick discussion or even an impromptu class. But the concept remained the same: Go out there and get a Jew to do a mitzvah. “Mitzvah” means “commandment”. A mitzvah is one of the 613 divine instructions to the Jew contained in the Torah. The word also means “connection”: a deed that connects the human being who performs it with G‑d, who commanded it. Before the Rebbe’s “mitzvah campaign”, the mitzvah was a private deed, performed by the “religious” Jew at home or in the synagogue. So it was only natural that the Rebbe’s approach raised many an eyebrow: “Tefillin on a hippie?” “What’s the point of doing one mitzvah on the way to lunch in a non-kosher restaurant?” Mitzvot were seen as the details that made up a religious Jew’s lifestyle—pointless when not part of the whole package. The Rebbe saw things differently. As a connection between man and G‑d, as a bridge between Creator and creation, a mitzvah is a deed of cosmic significance, a deed of infinite value unto itself. Citing Maimonides, the Rebbe repeated time and again: a single person performing a single mitzvah, could be the deed that tips the scales and brings redemption to the entire world and all of creation. "A tank is undeterred by trenches and pits and simply crosses them to reach the other side. An iron barrier—the weight of the tank simply crushes it. This is the purpose of the [mitzvah] tank if: there is a (spiritual) pit or trench, or even a barrier—things that are not associated with holiness—it nevertheless can go and fulfill its mission—to dispel evil and introduce good and G‑dliness into the world." 1994: Discovery of the "Reshimot"